Our strong, yet flexible paraben-free formula, infused with bamboo extract, keeps you in control of your style for 24 hours. This formula works by wrapping the hair strands, creating an instant barrier against frizz for an ultimate smooth finish. Get frizz control and bounce-back hold that lasts all day. Our light, sparkling fruity fragrance will leave your hair smelling fresh and vibrant. Hold can 10-12 inches from hair and spray in an even, all-around motion. Spray on dry hair to finish any style. Layer where its needed most for added frizz control and hold. Aqua/Water, Dimethyl, Ether, Alcohol Denat., Polyester-5, Polyurethane-6, Parfum/Fragrance, Limonene, Hexyl Cinnamal, Ethyl Hexyl Methoxycinnamate, Linalool, Caprylic/Capricic Triglyceride, Amyl Cinnamal, Bambusa Vulgaris Extract. F.I.L. D47284/2. Rated 1 out of 5 by doxie_mom from nope! won't wast my money again I purchased this hairspray because it was anti-humidity but it did not hold my hair or curls after styling. I curled my hair at 9 a.m. and by 9:15 it was flying away and by 10:00 it went completely flat. Rated 1 out of 5 by momeothree from NO hold This product did not hold hair shape at all. I spent time curling my hair and the product did not help hold the curl. It made the hair soft, which allowed the curl to fall out. I will be returning product to store for a refund. Rated 5 out of 5 by Whitt722 from Absolutely love it I absolutely love this product it offers great hold without making your hair soft and Unmanageable. I would definitely recommend this to any one. Rated 5 out of 5 by Sreiner from Sleek & Shine In a rush and need to put your hair up but afraid of those pesky fly-always or frizzy hair got you down?! Not today! 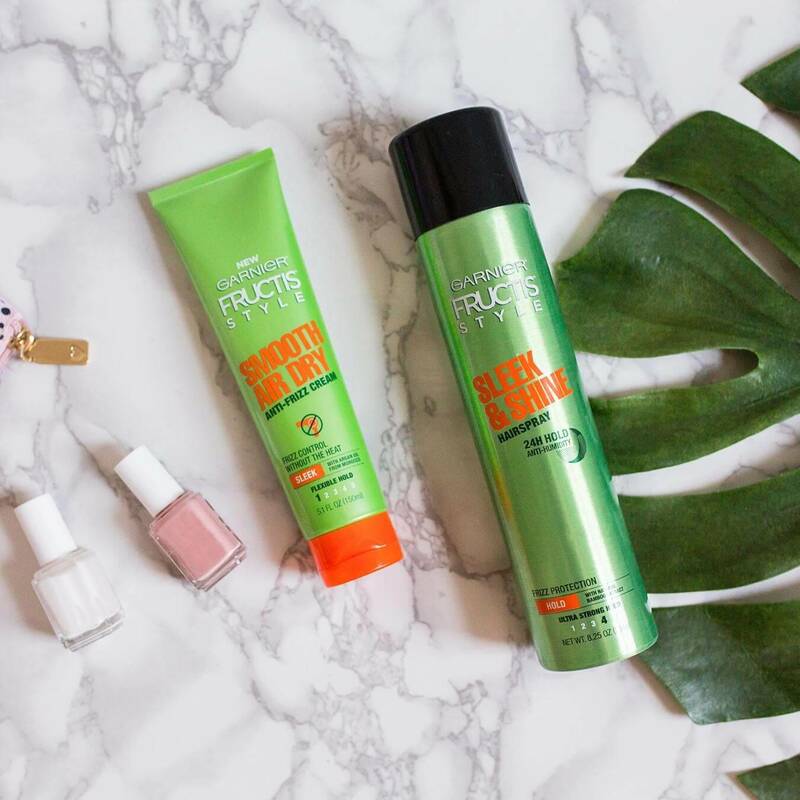 Garnier fructis style sleek and shine hairspray is for you! The great fragrance alone will have you sold! 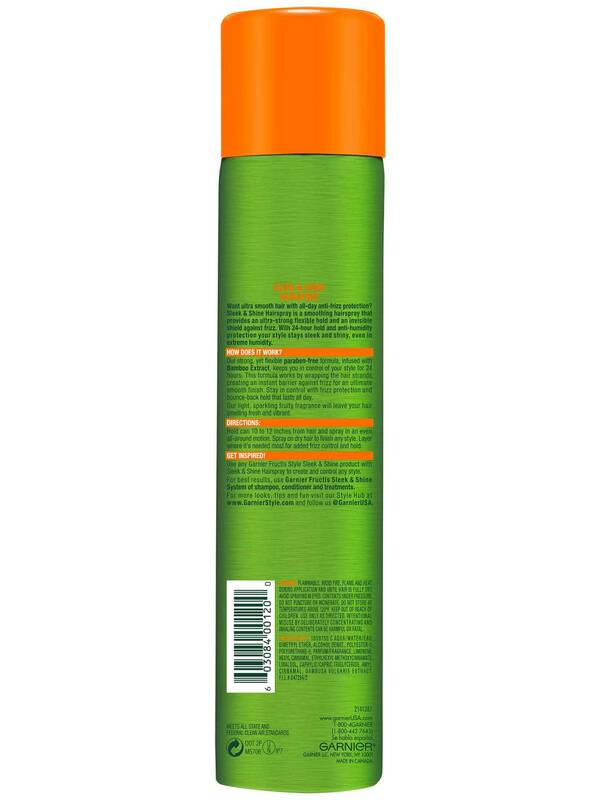 Rated 4 out of 5 by JaMie1991320 from Love this hairspray This spray holds true to its word about the frizz control. Usually when my hair is exposed to any moisture, it turns into a giant mess of frizz and fly always. This spray kept my hair in check even through all the yucky weather we've had here lately. It didn't make my hair feel sticky and the smell is amazing. The only negative I've noticed is it does tend to make the hair appear a little greasy by the next day, so constant washes is a must when using this product. Other than that, Id defiantly recommend this product. Rated 1 out of 5 by Birgit from 24 H hold? not even 8! The name says sleek & shine, I expected some extra shine, but nothing. But the worst, advertised as 24 hour hold. It lasted not even 8! Rated 5 out of 5 by Tepera09 from Best hairspray ever!!! I have always struggled with frizzy unmanageable hair. This hairspray works miracles!!! My hair stays in place but it’s not sticky or crunchy! And you can’t beat the smell of Garnier. I’ve tried expensive salon hairspray and seriously won’t ever use anything else.